Whether you're renewing your love of quilting, or making a quilt for the first time, Liz Marr will guide you to success. In this class, you'll learn to work with 5 quilt patterns, and learn all the skills you need to bring them to life! You'll go step-by-step through how to choose fabrics (color theory) along with factoring scale into your design. Customize your layout and quilt design, learn to cut and piece precisely with tools that are a must. Learn professional pressing for crisp results. 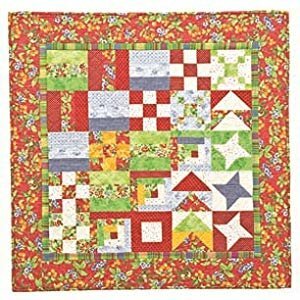 Experience adding sashing and boarders, how to sandwich and baste your quilt. Learn the basics of free motion quilting and walking foot quilting. Then finish your quilt with binding. ***Extra credit, add a label to tell the world what you've created. Liz's enthusiasm is contagious, and it's always sew much fun to have like minded creatives in the same room working towards the same goal. Kit fee $24.95 for the pattern and low loft bamboo batting. Other supplies will be discussed the first and second classes, and a discount will be offered to students so they may enjoy the best tools to achieve a professional finish.